The old magicians described Balam as a demon that "appears with a serpent's tail, flaming eyes, and three heads: a bull, a man, and a ram. He rides a bear and carries a goshawk." It is said he has flaming eyes and the tail of a serpent. He carries a hawk on his fist and rides the back of a large bear. 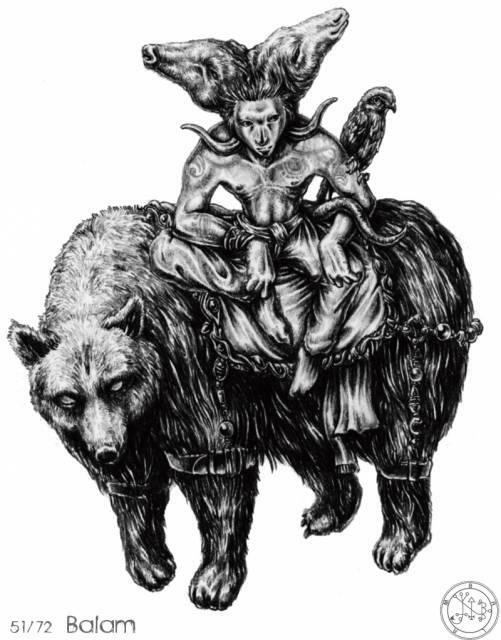 Sometimes Balam appears as a naked monster riding a bear. One description said Balam wears a royal crown with two horns projecting from it. His face appears as a goat with a long scraggly beard. He shows long fingers and toes with sharp pointed nails. He is the fifty-first spirit of the Goetia who commands over 40 legions of demons. Balam is a powerful king who "can tell of past/present/future events, teaches cunning, finesse, and the easy way to see without being seen," wrote the late Collin de Plancy. Some say Balam's specialty is to "make men seem invisible and witty." He teaches the art of cunning. It is thought this demon’s name is in some way linked to the Biblical magician Balaam.